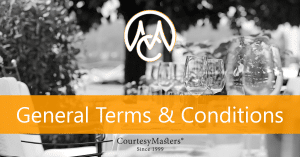 General Terms & Conditions of CourtesyMasters, United Courtesy Masters B.V., The Hague, The Netherlands. These terms and conditions apply to all services of-, all offers of- and all contracts with United Courtesy Masters B.V.. The contents of these terms can be adjusted at any time. The new version is effective as soon as we filed it at the Chamber of Commerce in The Netherlands. Deviations of these conditions are only legal when the CEO of CourtesyMasters confirmed this in writing. The applicability of any terms and conditions of the client is explicitly excluded. The Dutch version is leading and the Dutch Law applies.